The ideal glove for leadering monofilament, grabbing the bill of a marlin, or just getting a grip on anything slippery. Extra tacky Diamond-Grip polyurethane is direct injected onto nylon mesh palms for improved grip in wet conditions. Super tough Armortex along outer hand and reinforced index finger maximizes protection when wrapping leader on a big fish. Vented foam- backed mesh keeps hands cool and protected, while Spandura forchettes improve dexterity. Perforated neoprene cuff with Velcro closure assures a secure fit. Thumb, index and middle fingers are double-reinforced and have added numbs for a non-slip grip. Super tough Armortex® on index finger and outer glove maximizes protection when leadering big fish. 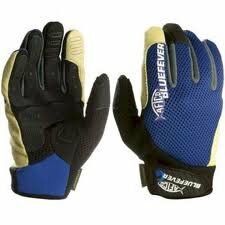 Tacky Diamond-Grip, direct injected onto nylon mesh palm, improves grip in wet conditions. Vented foam-backed mesh keeps hands cool and protected. Neoprene cuff with Velcro® closure assures a secure fit.